On this episode of Westwood One's Rock Talk With Mitch Lafon, new interviews with Canadian guitarist ALDO NOVA and Tesla's FRANK HANNON. Former Guns N' Roses & Great White manager Alan Niven co-hosts. 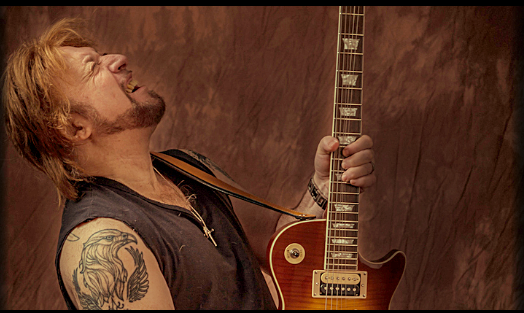 In our first interview, guitarist Aldo Nova talks about his new album 2.0, where does this reboot lead, future plans, Foreigner's Lou Gramm, his work with Bon Jovi, working with Celine Dion, Rick Hughes and SWORD, Blood On The Bricks, and much more. Our second interview is with TESLA guitarist, Frank Hannon (interview starts at approx. the 1hr03 min. mark). He talks about his latest release 'From One Place... To Another Vol. 2', Tesla's new album Shock (approx. 1hr 18min. ), new producer Phil Collen, Aldo Nova, future solo releases, why he's chosen not to cover Led Zeppelin, the production team of Steve Thompson & Michael Barbiero (approx. 1hr 27 minutes), upcoming TESLA deluxe editions (approx. 1hr 34 minutes), his new HUSH video and much more. A fit, handsome twentysomething in a leopard-print bodysuit exits a helicopter and is followed by armed guards toward some kind of warehouse. Entry is gained via a magical Gibson Les Paul, which, naturally, the young hero uses to fire laser beams at the door. Inside, he meets his band onstage and performs “Fantasy,” among the earliest staples on MTV, and one of the best and most perfect singles in rock history—a flawless balance of pop-metal craftsmanship, studio ingenuity and hard-earned musicianship, flaunting killer guitar leads and trailblazing synth parts. “I don’t know what possessed me to wear a stripper’s leopard-print outfit,” Aldo Nova says today, chuckling. A remarkable record from start to finish, Also Nova can be understood in rock history as both an icon of its era and a profound but still unsung influence on things to come. On October 19, the guitarist, vocalist, keyboardist, songwriter and producer will release his first new album release in over three decades. Titled 2.0 (Megaforce), it’s a collection of supercharged reinventions of six classic songs off his self-titled smash debut, plus one new original, “I’m a Survivor,” initially written for Foreigner singer Lou Gramm. The idea for 2.0 was set in motion in late 2016. “When I turned 60, I told myself I was going to turn the page,” Nova says. “I realized I had to shut the book and write a completely new book.” He wanted to celebrate his debut’s 35th anniversary in some fashion, but rather than simply remaster and reissue the album, he thought to “bring the songs into the 22nd century.” He was sober, calm, confident, full of faith and in the best shape of his life. As it turned out, the angst, ego and hunger of his younger days were overrated. A Montreal native, Nova was approached by a 15-year-old Celine Dion to producer her first album, and released Blood on the Bricks on Jon Bon Jovi’s Jambco label in 1991. It stood as the culmination of a long-running friendship and, as any knowledgeable rock fan might argue, a thank-you note of sorts: the rock superstar lifting up the personal hero whose sound provided the blueprint for his own hits. Nova provided guitar, keys and background vocals for the demo of Bon Jovi’s first hit, “Runaway,” and ended up playing with an assemblage of session musicians throughout Bon Jovi’s 1984 self-titled debut. Nova’s imprint is also all over Jon Bon Jovi’s debut solo album, Blaze of Glory—especially the chart-topping title track, on which Nova’s writing and producing went uncredited but were absolutely essential. Over the next three decades, Nova’s journey would take him through great professional highs and painful personal lows, and eventually into self-discovery and spiritual contentment. He decided again to focus on his roles as a writer, producer and session musician, capitalizing on the goodwill he’d generated in the industry to put food on the table for his family. During the ’90s and 2000s, in addition to tracks for popular foreign-language artists, Nova collaborated with Jon Bon Jovi, Faith Hill and Clay Aiken (he co-wrote his hit “This Is the Night”), and did hugely successful work with Celine Dion. In 1997, Nova won a Grammy for Dion’s blockbuster album Falling Into You—“It’s a paperweight,” he laughs; “what I do today is what counts”—and co-produced/co-wrote later Dion singles like the global smash “A New Day Has Come” and “You and I,” the latter chosen as Hillary Clinton’s campaign song in 2008. Canadian music-industry bigwig Paola Simonetto became the love of Nova’s life, as well as his advocate and catalyst. Simonetto continues to inspire and support Nova, though not from this earthly plane. “During the time that I was working on 2.0, my wife was diagnosed with pancreatic cancer,” he explains. “I managed to finish the album right before she passed away on Christmas Day. I still was able to take care of every doctor’s appointment, every chemo treatment. I was cooking and cleaning and at night I worked on my album.